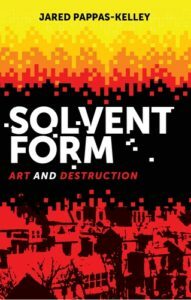 Solvent form: Art and destruction is a book for understanding art differently through art’s destruction as well as stories like Scheherazade from One Thousand and One Nights or the Sarah Winchester story. I really like Baudrillard’s Fatal Strategies as a method for collapsing logic structures, but I have also been reading a lot of artist writings and collections of these writings. A good example would be Please Pay Attention Please by Bruce Nauman or Agnes Martin’s Writings. I find it really intriguing to think about how artists are making sense of their world through their visual work as well as through writing. While researching the Sarah Winchester and Winchester house stories I took a road trip through California and ended up stopping at the Hearst Castle at San Simeon. The mansion was built for William Randolph Hearst (the newspaper magnate) as a retreat from the city where notable guests and celebrities were flown in and attended nightly dinners. I had a very annoying tour guide show me around, but the section of Solvent form that looks at the film Citizen Kane (which was inspired by the Hearst story) probably wouldn’t have come about without that visit. I usually write everything on computer, but also incorporate an almost unintelligible system of hastily jotted down notes on scraps of paper when doing other things that have to then be transcribed as bullet points or ideas for details that need to be added. I had been working with Sylvère Lotringer and a couple other people with a very early version of what became Solvent form: Art and destruction and I had asked where would be a good home for this book and Manchester University Press was suggested. I am actually working on a couple book projects on the backburner at the moment. One is a collection of manifestos commissioned by contemporary artists and thinkers, but I have also been working on a collection of short reflection pieces on works by contemporary artists such as Janine Antoni, Uta Barth, Terrence Koh, and Kiki Smith. Each piece of writing is structured as a little vignette that is almost like an oracle of sorts for giving a specific insight for understanding it on a deeper level. Don’t just think it, write it down. Also, write for yourself and try to capture a truth and the right people will find it. I’m not exactly sure why, as I don’t think it is an amazing book or particularly strong story, but Nathaniel Hawthorne’s The Blithedale Romance comes to mind. As a small child I lived for a while in a sort of commune-style community on an island off of the west coast of the US and Canada. Right now it all feels a bit utopian or optimistic, so maybe I have a soft spot about experiments and books like that. Maybe I need to go back and read that Hawthorne as, if I remember correctly, it ended very badly for all involved! I end up reading so much theory and art related work that I really need to balance it out sometimes with something a bit more pulpy. I have a soft spot for cheesy stuff like science fiction, but don’t get much time to indulge in that. I have a friend who writes fantasy novels and she used to write me in with cameos in some of her books. I Have recently been re-reading old William Gibson cyber punk stuff, which is amazing to think how much of his ideas are now actual technology. I also recently re-read some old Octavia Butler, which is also kind of sad to see some of her rather dystopian ideas seem to be playing out in current politics. Several years ago I was supposed to work with Paul Virilio at a workshop he was doing, but then he had to cancel (as we found out later he had a heart attack). It was supposed to be rescheduled, but then never was. With his death last month, would have been nice to attend a dinner party with him. Solvent form: Art and destruction is available to buy now. Jared Pappas-Kelley is a visual artist and Senior Lecturer in Fine Art at Teesside University.